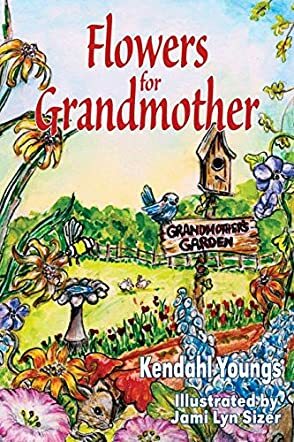 Flowers for Grandmother by Kendahl Brooke Youngs is a delightful children's pictorial book which introduces readers to the concepts of flowers, gardening, relationships, and emotions. It is Kendahl's grandmother's birthday. Kendahl wants to get her grandmother something special for her beautiful garden. She does not want to buy her grandmother something she already has so Kendahl's mother takes her shopping in search for something new for Grandma's garden. Kendahl Brooke Youngs has written a charming children's picture book which is not only filled with bright and vividly drawn illustrations, but also contains a life lesson/moral concept to the educational story line. When Kendahl wants to give her grandmother a special gift for her birthday, this shows the kindness and love that has developed in the relationship between her and her grandmother. The story has a great intellectual and educational aspect to it as well. During the shopping adventure, Kendahl's mother explains to her the process of how to properly grow flower seeds or bulbs. Teachers and educators can use this as an instructional lesson plan to teach the process whereby a plant or flower grows. Parents and guardians can use this book for educational purposes or just for a fun, interactive read containing a planting activity. Planning time for the activity can also assist parents and grandparents in developing interests and bonds with their children/grandchildren. Kendahl Brooke Youngs has written a lighthearted, interactive story for readers of all ages to enjoy.